Preheat oven to 350°F. Place cut cauliflower on a large sheet of heavy duty foil, season with garlic salt and wrap cauliflower firmly with foil, crimping foil on top to seal packet well. Place packet in oven proof dish and place in oven with baking potatoes (make sure you poke potatoes with fork before placing into oven). Bake cauliflower for 30 to 40 minutes until very tender and bake potatoes for 1 hour and 15 minutes until fork tender. Remove vegetables from oven. Cut hot potatoes lengthwise and scoop out pulp into large mixing bowl. 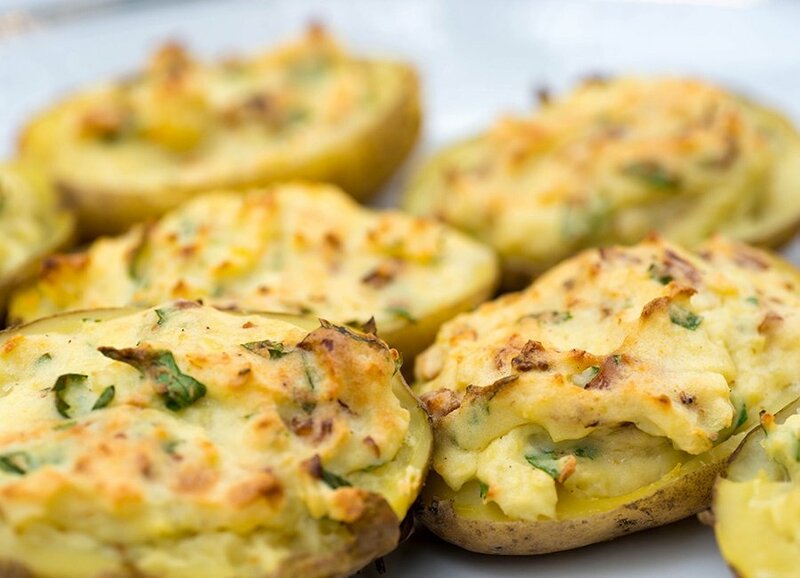 Place potato skins in oven proof casserole dish. Add tender cauliflower to potato pulp and add the warm broth, sour cream and soup mix. With electric mixer, whip potato/cauliflower mixture until light and fluffy, adding more warm broth if needed. Divide whipped cauliflower/potato mixture between the six potato skins and top with shredded cheese. Bake in oven for 15 minutes until hot and cheese is melted.